Ideal for a mixed-use development, the 28-rai or 11-acre site on Ratchadapisek in Bangkok is available for sale by tender through CBRE Thailand. Appointed as the agent, CBRE Thailand is offering a 28-rai or 11-acre site for sale by tender. With a Floor Area Ratio (FAR) of 7:1 the site has the potential to be developed into a landmark mixed-use development. CBRE advises that the tender submission date is Wednesday 28 November 2018. The site offers easy access to mass transit lines in one of the most sought-after locations in Bangkok at the new Thailand Cultural Centre interchange station of the MRT Blue Line and the under-construction MRT Orange Line. 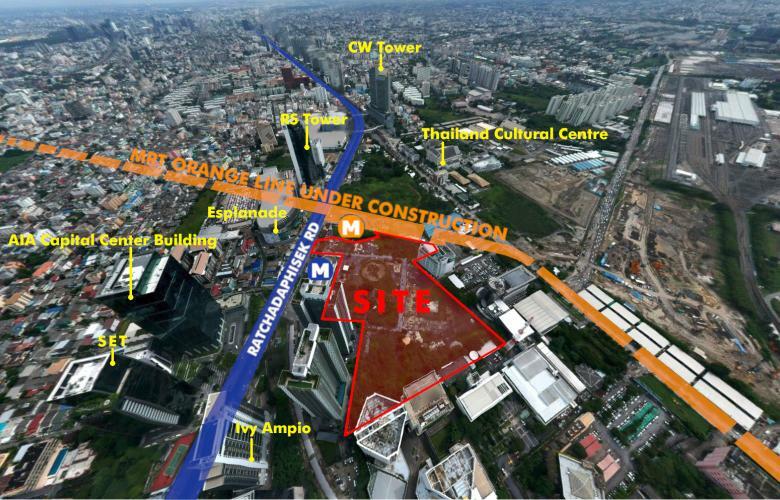 The site is opposite the Grade A AIA Capital Center office tower and the Esplanade Ratchadapisek shopping mall, with many residential developments in the surrounding area. Over the past 10 years, land prices in the Ratchadapisek area have increased by 250% as it has become a hotspot for condominium buyers and office tenants. This has resulted in high demand for sites suitable for both residential and commercial development. Given the scale and location of this site, it has great potential to be developed into a new Bangkok landmark with a mix of uses.